Archive photos are set out geographically from the coast up to Las Heras, followed by modern pictures laid out in the same way on the following page. 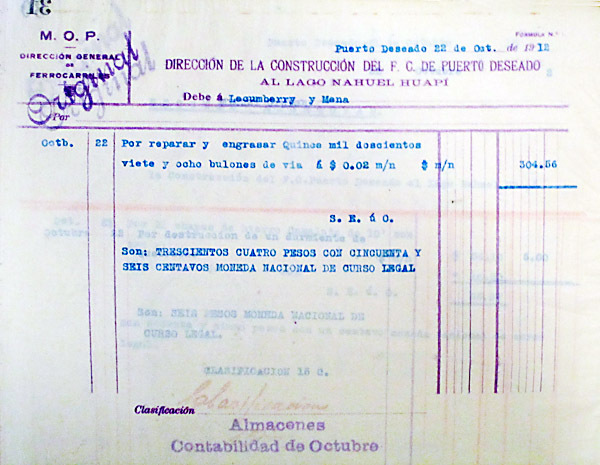 A sample debit voucher from the construction period (2). Some 15,228 track screws were cleaned and oiled at a cost of 2 cents each. 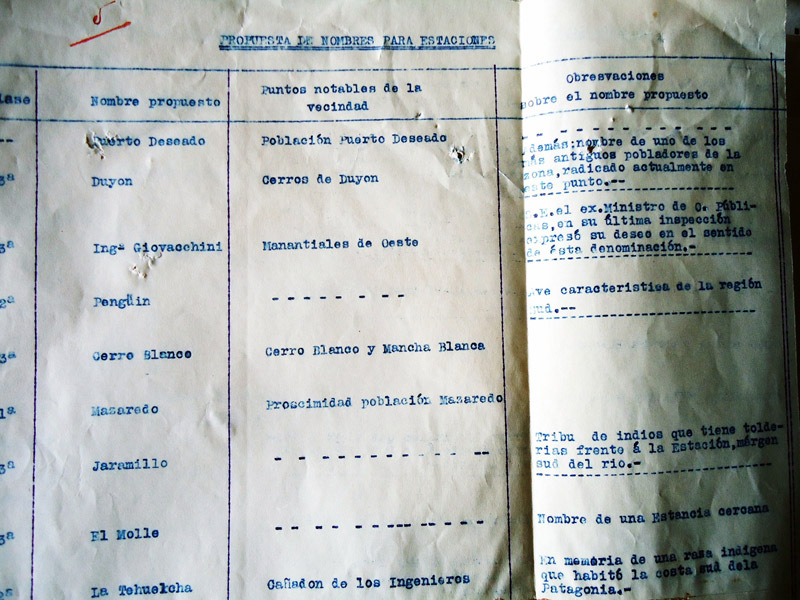 An early list of the proposed station names, below, shows several suggestions that never saw the light of day, such as Duyon, Pengüin, and Mazaredo. 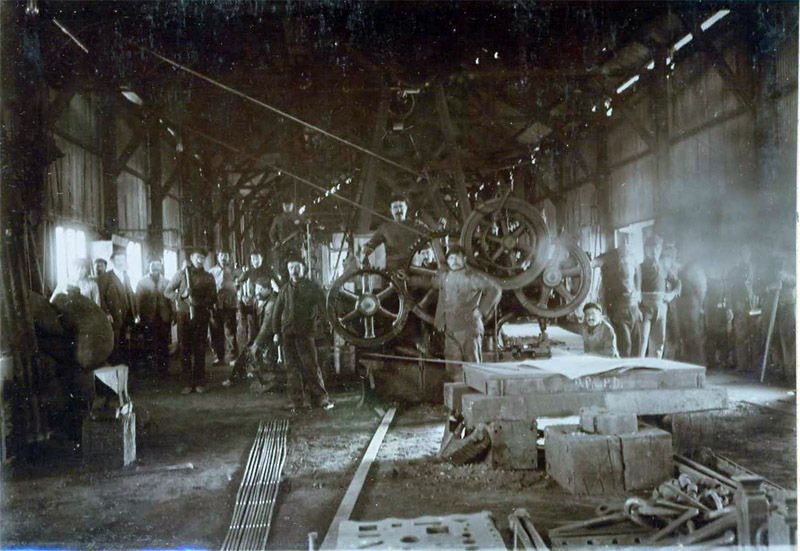 A number of interesting pictures taken during the construction work by Ing. 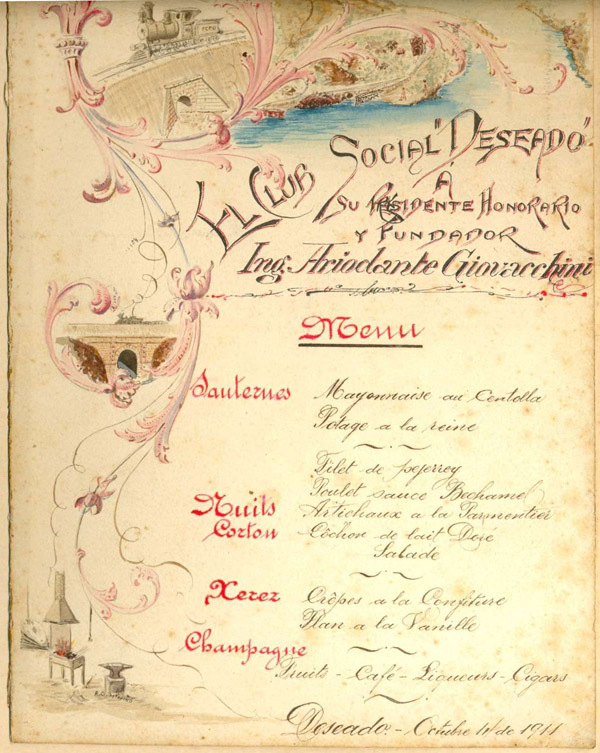 Giovacchini and his colleagues, have recently been posted on Puerto Deseado historical website. 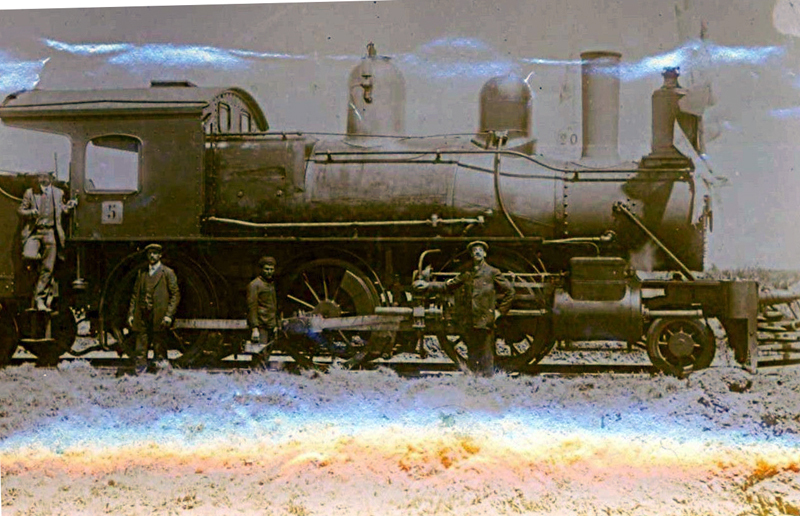 The following three images show one of the pair of ex FC Andino Baldwin 2-6-0s, nos. 4 & 5, in use on works trains. 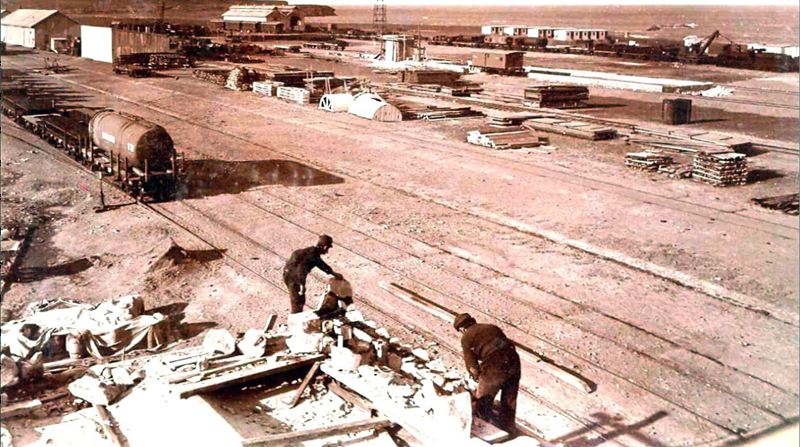 The yard at Puerto Deseado station was the hub of all the activity, as seen in this shot looking down on the site. The new station building begins to take shape in the foreground, whilst in the far background is the carriage shed. 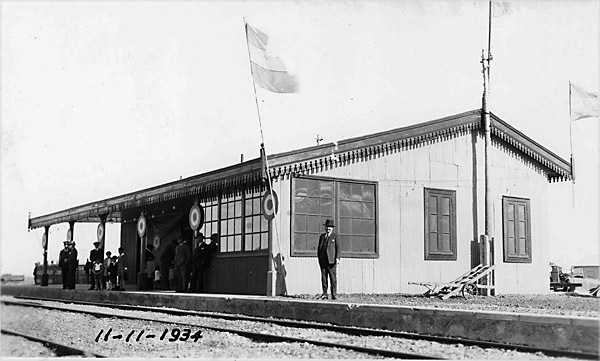 Whilst construction was underway on the track and stations, workshop staff were busy erecting the new Belgian pacifics – in the open air as there was no proper erecting shop. 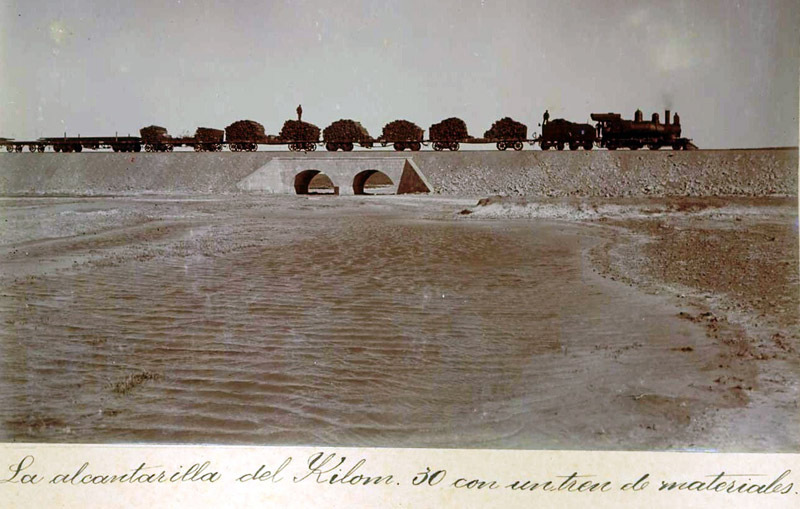 This picture was found in the Archivo General de la Nación in Buenos Aires. 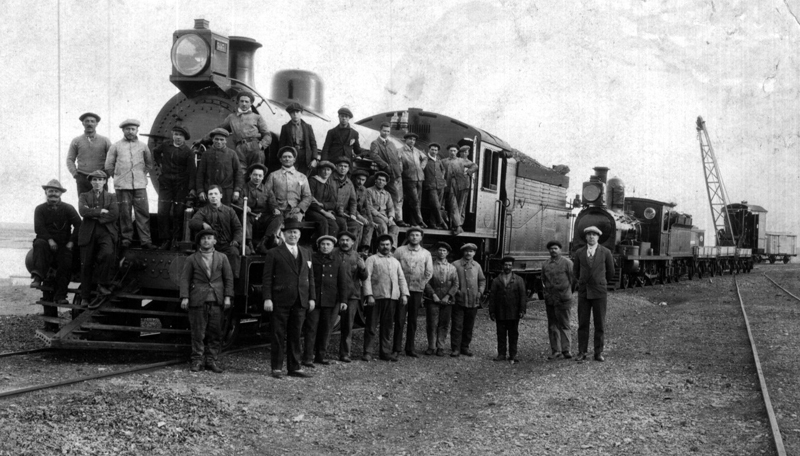 The works staff pose with one of the new locos, whilst in the background is Sharp Stewart 4-6-0 no. 163, ex FC Sud, ex FC Buenos Aires y Pto. de la Ensenada. 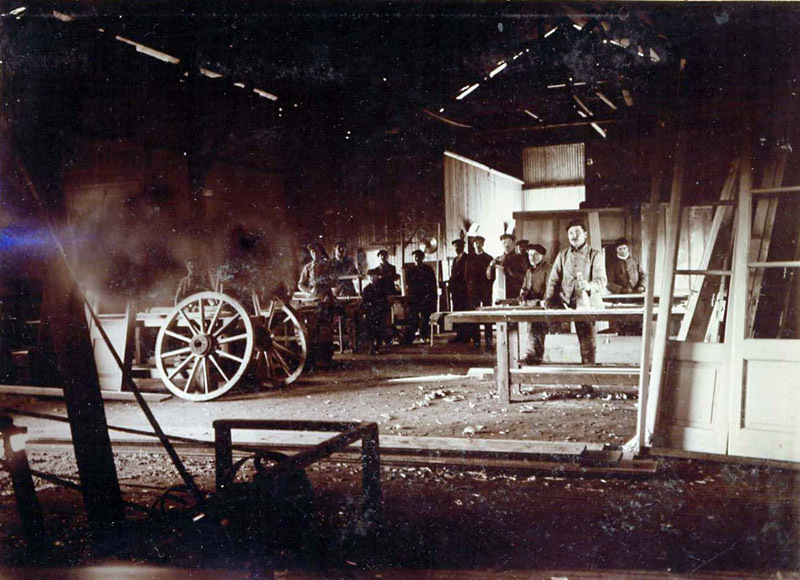 These are two views taken within the workshops. It might be wondered why there are cart wheels there, but it should be remembered that the squads of men needed to be supplied with food and water and that this was delivered by horse-drawn vehicles. Once the railhead was established materials could be taken up by train. He is a 'plataforma' wagon well loaded with all sorts of things on board. 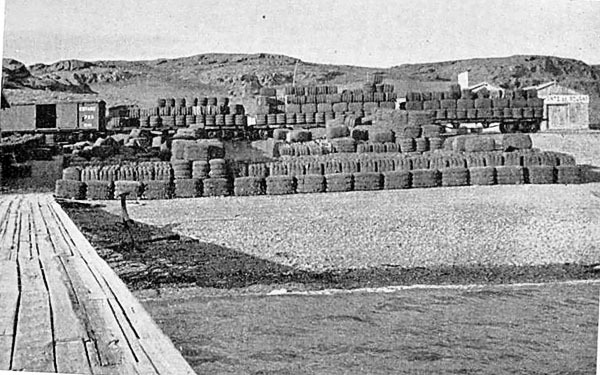 The barrels probably contain Portland cement as at that time they were used to keep it fresh when stored. 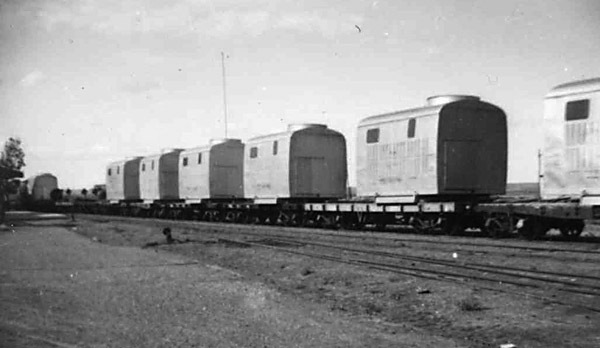 The unusual frameless bogie tank wagons have already been mentioned. 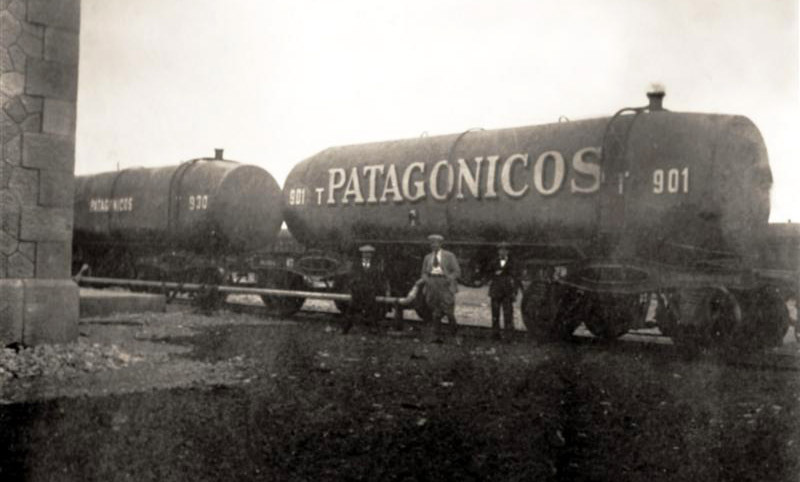 The precise significance of the 'PATAGÓNICOS' name on the side has not yet been discovered, unless it was merely a reference to the railway name in the same way as on the sides of the passenger carriages. 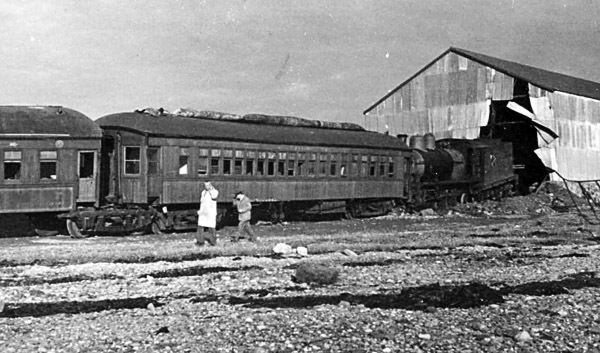 The following photo was discovered in Tierras Australes, Jerónimo Gómez Izquierdo, published by Empresa Editorial Bell, Buenos Aires,1942, page 82, and kindly forwarded by Señor Diego de Bunder of Puerto Madryn. 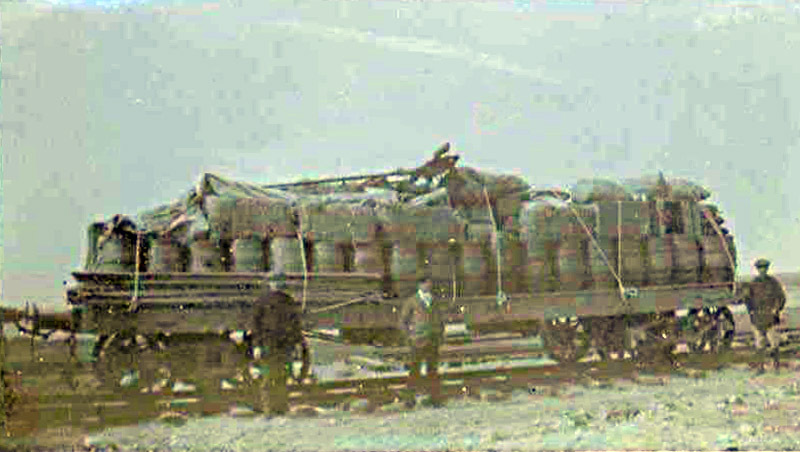 It shows a line of wagons carrying wool bales at Puerto Deseado. 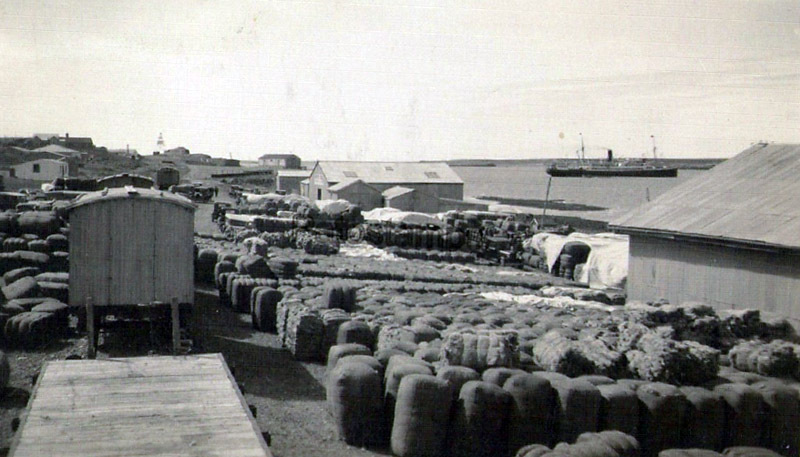 This view was found in Mercado Libre and shows bales and bales of wool lying on the dock side, obviously awaiting the arrival of a ship. From time to time Ing Andriote took his camera for a ride on the petrol trolley to take pictures of the work. He took sample views of first, second and third class stations. 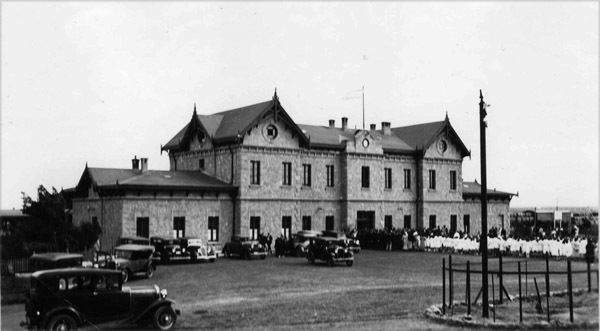 The layout and facilities provided at each station had been classified into three different sizes. Within each class the stations were very standardised. First class station at Pico Truncado, above. The size of it compared to the second class station at Km. 60, below, is very noticeable. 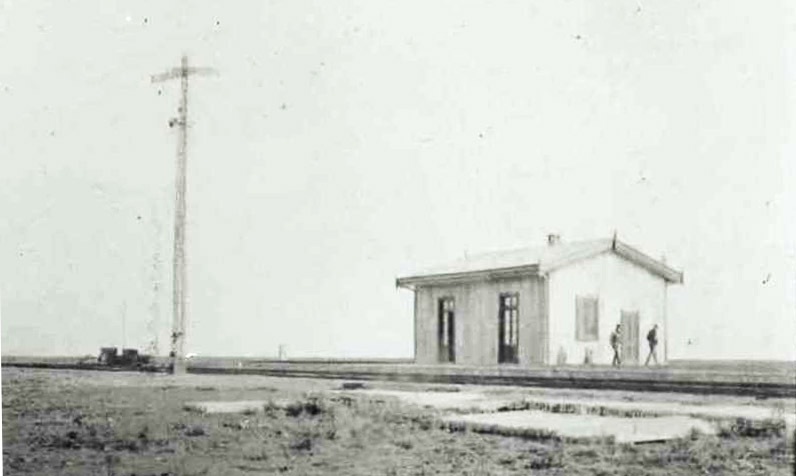 Third class station, showing the two arm home signal. 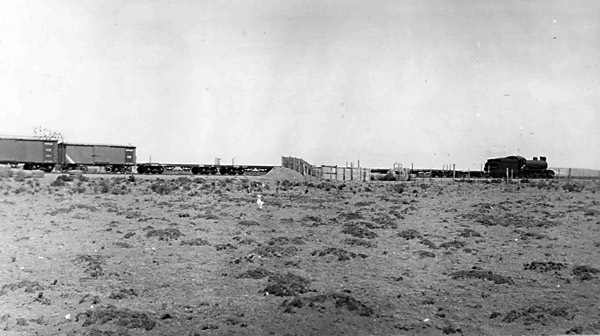 In the 1950s a large number of gas compressors for the oil field were transported up the line. 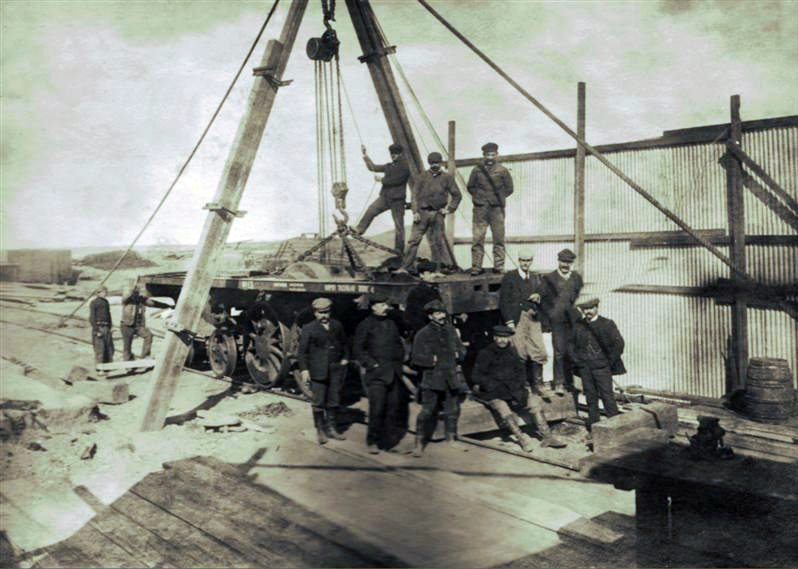 These weighed forty tonnes each; hence their positioning one on each wagon. A number of these have survived as useful sheds throughout this part of Patagonia (2). 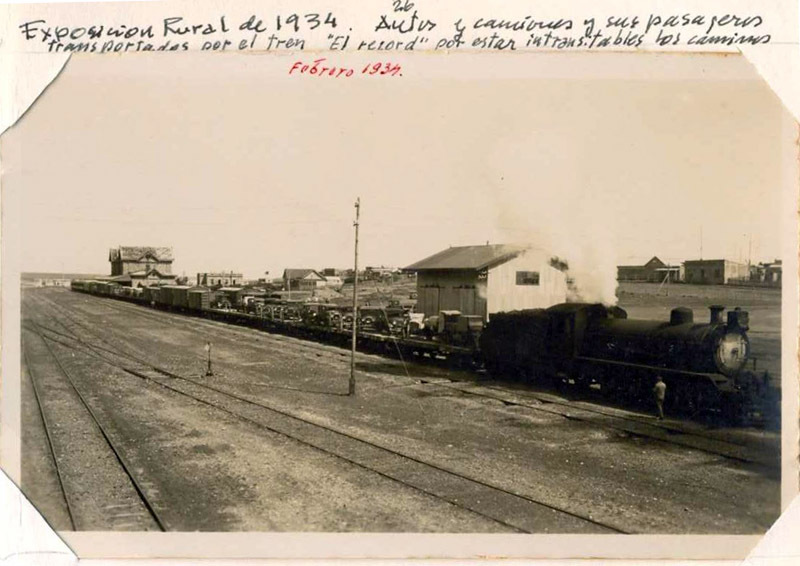 One particularly spectacular accident occurred when a train loaded with minerals from Chile ran away on the approach to Puerto Deseado station and collided with a line of carriages after running through one of the big sheds (2). Two Harlan & Hollingsworth coaches are visible. 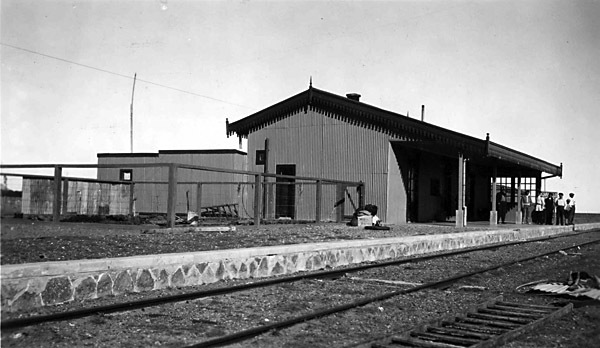 A blueprint plan of Puerto Deseado station and yard. The port is off the the left, and the line to Las Heras leaves to the right. 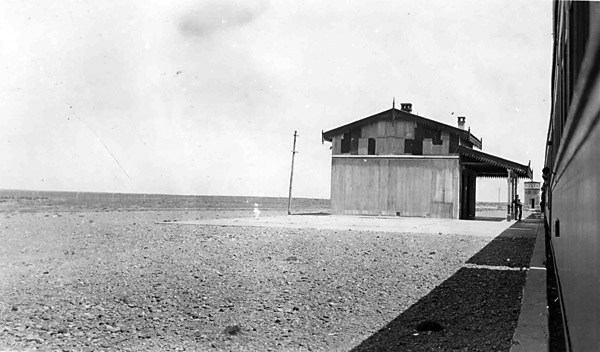 An early shot of the road side of Puerto Deseado station building. There are coaches to the left in the platform. A slightly later view, judging by the growth of the bushes to the left (2). The cars and the waiting children suggest this was some special occasion during the 1930s. The platform side of the Pto. 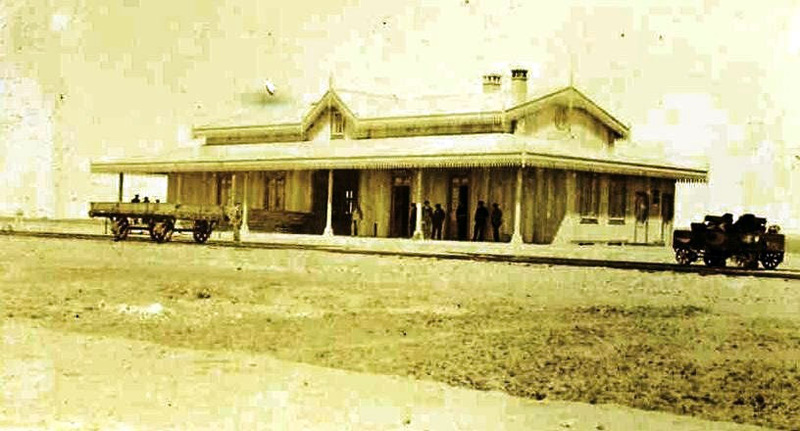 Deseado station building in 1936, with a portion of the platform enclosed, possibly as a restaurant. 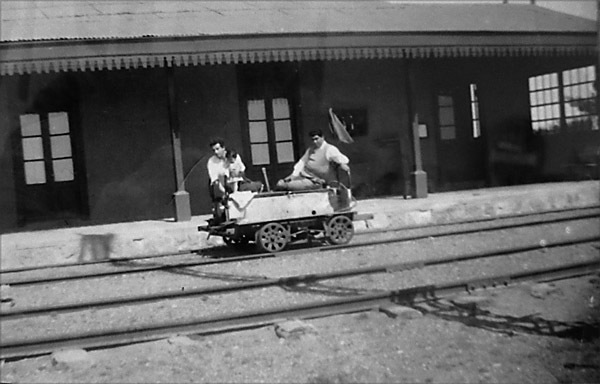 A permanent way trolley or 'zorra' at Tellier in 1940 (2). 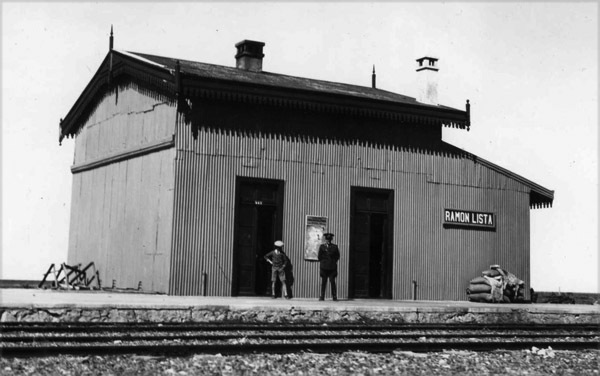 Ramón Lista station building in the early 1930s (2). A small canopy was later added in front as the following picture shows. This also shows the emptiness of the landscape, with nothing between the camera-man and the straight-line horizon. 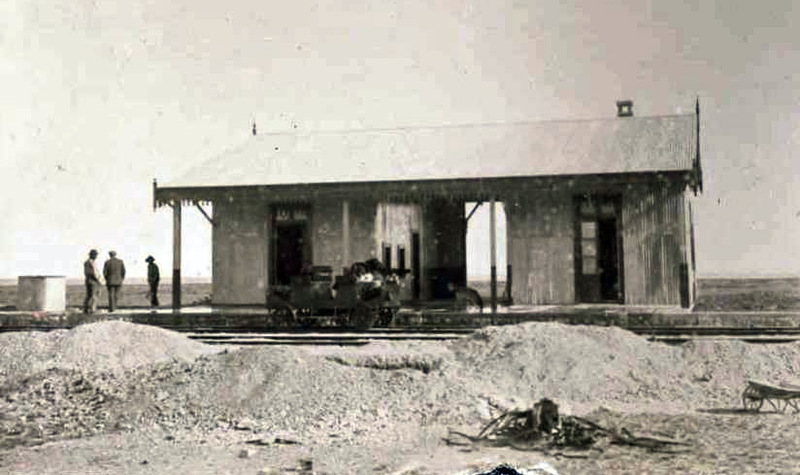 The station building at Jaramillo in 1936. One of the Drewry railcars after a derailment (2). No further details are known. 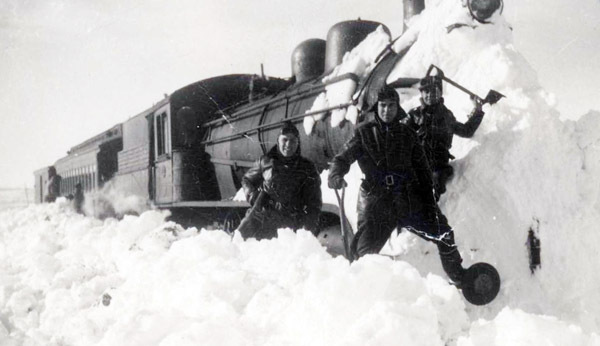 Soldiers assisting in the line's clearance from snowdrifts, probably after the Second World War. The livestock loading point at Cerro Blanco?? in 1936. 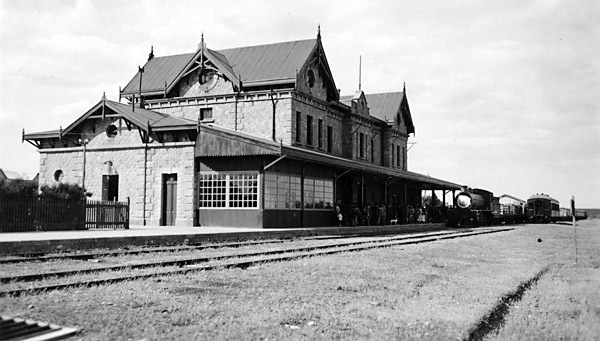 The station building at Las Heras in November 1934 (2). 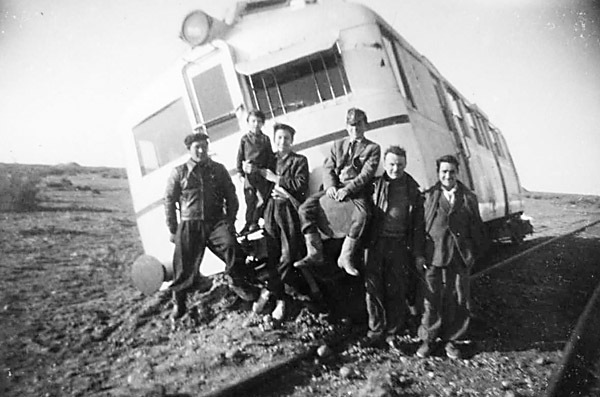 An unusual event in 1944 was a forced landing by a Lockheed Electra aeroplane at the side of the railway track, and then a collision with it by a train! In 1974 a feature film – La Patagonia Rebelde – was made telling of the clashes between rebellious peones and the army in the early 1920s. 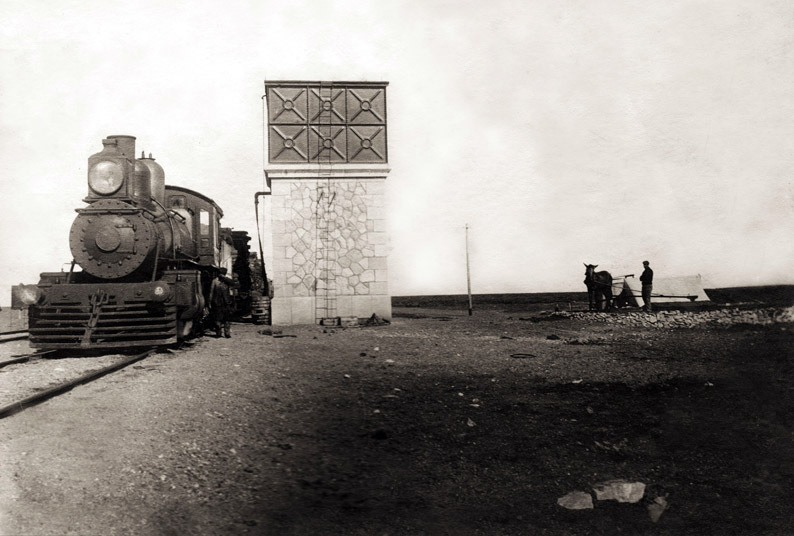 Some of the events had taken place along the railway, especially at Tehuelches station, and thus a train plays a major part in the story. The images below show a still photo and a poster from the film. Modern photos along the route have been hived off into a separate page which follows this one, in order not to have too long a page here. Click here to move to that page.